This is possibly one of the most talked about entries for this 70th Anniversary Race. This new 100-foot supermaxi is designed by Verdier Yacht Design & Vplp to push the boundaries of technology with the ultimate goal of taking line honours this year. The boat is the culmination of a two-year project. Built at Hodgdon Yachts in Maine, Comanche was sailed for the first time on October 13 and will be spiced with Australian flavour partly because her co-owner is Kristy Hinze-Clark, a former supermodel from Australia married to Jim Clark. 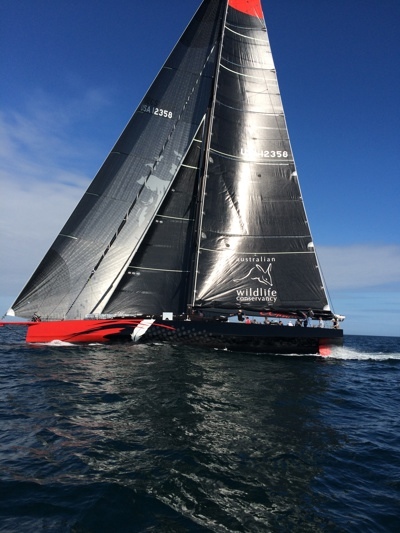 Her mainsail also reflects Comanche’s Australian connection, as does Aussie crew; boat captain Casey Smith, Ryan Godrey in the pit and Chris Maxted “floating”. Other big names are Stan Honey (navigator) and New Zealand’s Kevin Halrap on tactics. Comanche is skippered by renowned US sailor Ken Read with 21 international crew. Jim Clark, an American entrepreneur and computer scientist, founded several prominent Silicon Valley technology companies, such as Silicon Graphics Inc. and Netscape Communications Corporation.